Dental implants are a permanent solution to missing teeth and is a treatment that has benefited many of our patients in Scottsdale, Cave Creek, and Carefree. If you are missing teeth and would like to restore those areas of missing teeth, come visit Scottsdale Dentist Dr. Samuel R. Swainhart. At Carefree Smile we place and restore dental implants, which can improve your dental function and aesthetics. A dental implant is essentially a titanium screw that is placed into your jaw bone. When the bone heals and the implant has fused to the bone, an implant crown is placed which looks, feels, and functions like a natural tooth. It is time to stop feeling self conscious about missing teeth and contact a Scottsdale Dental Implant Dentist today! Dental implants are a permanent solution to helping you live better and feel better about yourself. What do dental implants cost at our Scottsdale Dental office? The cost of dental implants varies depending on your needs and current situation. That is why we strongly urge you to contact Carefree Smile in North Scottsdale to schedule a consultation, so Dr. Swainhart can answer all your questions and evaluate your needs. We are accepting new patients from North Phoenix, North Scottsdale, Cave Creek, and Carefree. Dental implants can only be placed in healthy, adequate supporting bone. A consultation is required to determine if dental implants are a good choice for you. 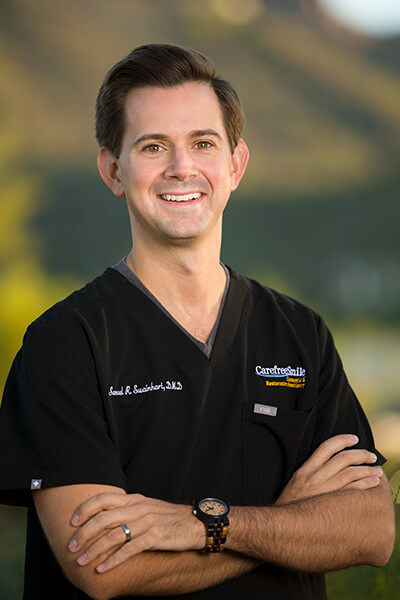 If you live in the North Scottsdale, Cave Creek, Carefree, or North Phoenix areas, schedule a consultation with Scottsdale Dental Implant Dentist Dr. Swainhart at 480-488-7010. Many many thanks to Dr. Swainhart and his AMAZING team! I am so glad I found Carefree Smile! Great work, Dr. Swainhart and everyone at Carefree Smile! Gina, Kelly, and Sara feel like my extended family and I am always happy to come to the practice. Dr. Swainhart took the time to get to know me and my family. He is very thorough and detail oriented. Thank you! The entire staff at Carefree Smile is excellent. I highly recommend Dr. Swainhart to anyone who is somewhat nervous at the dentist and appreciates care, concern, and detail. What happens if I don’t wear my retainers? Do Dentists Use Mercury Fillings Anymore?